We are pleased to offer for sale this pack of 10 33 1/3 RPM LP Vinyl Record Storage Boxes. 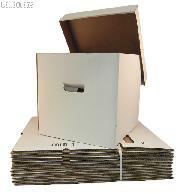 The Vinyl Record Storage Box is a high quality and economical choice for safely storing your record collection. Made of heavy duty 200 lbs test white corrugated cardboard, this Vinyl Record Storage Box features double thickness on the handles and bottoms for additional strength. When storing 33 1/3 Records or Laser Discs, the Vinyl Record Storage Box has a maximum capacity of the 65 of either Records or Laser Discs. The dimensions of each assembled box are 13" x 13" x 14". This listing is for a bundle of 10 boxes.